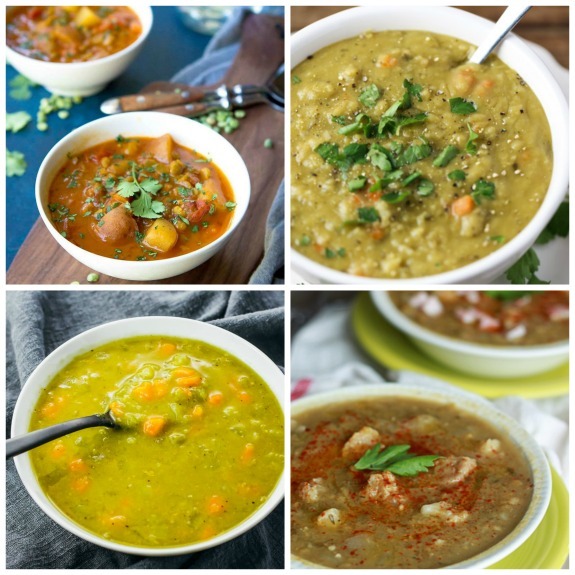 It’s soup weather, and here are Four Appetizing Recipes For Vegetarian Split Pea Soup that all look so delicious for a meatless dinner to make in the slow cooker or pressure cooker! Click to PIN Four Appetizing Recipes for Vegetarian Split Pea Soup! Click here for The Best Instant Pot and Vegetarian and Vegan Soup Recipes! This Friday Favorites collection of Four Appetizing Recipes for Vegetarian Split Pea Soup features four different comforting and delicious ideas for meatless split pea soup. 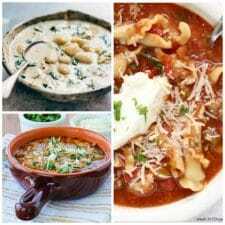 You’ll love the flavorful combinations of vegetables and split peas that make these soups so hearty and soothing to eat. And we’ve updated this post to give you options for vegetarian split pea soup made in the slow cooker or the Instant Pot. Whichever cooking method you choose the result will be a creamy, thick and very tasty soup; even meat eaters won’t miss the meat in these tasty soups. This hearty, delicious Southwestern Instant Pot Split Pea Soup with Potatoes from Cookin’ Canuck will become a go-to favorite. This soup has cumin, paprika, and oregano to add flavor to the split peas and tomatoes! Crock Pot Vegetarian Split Pea and Cauliflower Soup with Optional Ham Add-In from Kitchen Treaty includes cumin and a garnish of smoked paprika for a warm and smokey flavor. Slow Cooker Split Pea Soup from Tabs and Tidbits has leeks, carrots, and parsley and Dayna says this soup freezes well! The slow cooker blends the flavors, delivers a tasty soup and gives you the day for doing something else and have dinner ready when you get home. Instant Pot Split Pea Soup from Savory Tooth can be enjoyed meatless or if you enjoy meat you can add bacon or ham. This soup is thick, creamy and delicious for a cold day! My pleasure. Love the smoked paprika in this one!